I love cricket and my son too. My 9-year-old son goes to the cricket academy for practice and sometimes me too go with him. 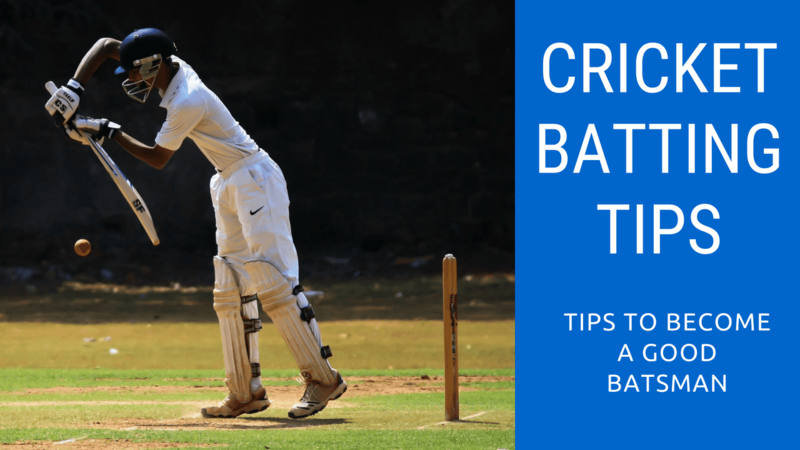 In the discussion with young players(U-14 and U-16), the common question comes from all of them is: What is the best way to learn the batting skills or what are best cricket batting tips? Well, I am not a professional coach of the cricket. I answer based on my observation and research which I am doing nowadays to teach my son. An important tip for a batsman:The most important thing any batsman needs to learn is “watch ball early and play late”. See the ball till you hit it from the bat. Doesn’t matter how many techniques you know, you can not execute it if you do not have the focus to see the ball from start to end. Believe me, Focus is the key to success on the crease. Let me try to express the importance of focus by a story. I am sure you must know about popular test “the bird’s eye test” which is taken by Guru Dronacharya. Duryodhan accused Drona that he is favoring Arjun and ignoring others. Drona took a test of all his students to prove him wrong. Dronacharya put a wooden bird on a tree and then gathered all the students for a test. He asked to strike the eye of the bird by their archery. He asked a question for everyone before letting them set their arrow loose. The question was: What do you see there? I can see a wooden bird, tree, branches and moving leaves along with other birds. Everyone(except Arjun) given this reply and Drona did not allow them to strike the bird’s eye. Drona smiled and allowed him to strike the bird of eye. Whereas others were looking all things surrounding the goal, Arjun was focused on his goal only. Similarly, when you are on the crease; your focus should be on the ball. How much time an over take? I think it is around 3-5 minutes and a ball takes 3-4 seconds so you typically need the focus of 3-4 seconds at a time. When a ball finished or a run finished, take a breath, look surrounding, relax you solider, tight your gloves, talk to yourself and then again ready to focus for next 3-4 seconds. Your focus starts when bowler starts their run-up, whether he is a fast or spin bowler–keep your eyes on your goal and remember your goal is the ball in hand of the bowler. We heard many times that batsman gets out because of the pressure of runs. Did you ever think how pressure can force you to play a bad shot? If yes then let me answer you. Batsman pre-decides the shot before the bowler start the bowling when he is in pressure. He wants to play the shot as he decided–if the bowl does not come as he expected then he gets confused whether he continues with pre-decided or have to play as per practice. He loses his focus in this confusion and that cause the bad shot or wicket down. So, how to hit boundaries under pressure of runs? Let me open the secret of worlds top finishers, how they hit the ball under the pressure of match victory. Decide the shot when it is in a midway. Shot selection according to the ball delivered is very crucial, so you have to learn to play of many strokes. We will discuss the basics of strokes soon in this article. The first basic thing you should know is how to grip the bat. The bat should be gripped in such way to move your wrist and bat easily in all directions. Watch the video of god of cricket Sachin Tendulkar to know how to grip the bat. Stance is the position when a batsman is ready to face a delivery. The wrong stance can be caused to back and foot injury. Body weight of batsman should be on the ball of their feet, knees should be slightly bent. Stand sideway: Do not open the shoulder, stand sideway. Head position: Head position is so important. The head must be slightly forward of your body and above the front foot and in line with your toes. See this video where Sachin is telling the importance of head position while playing straight drive.Click here to watch how Ricky Pointing is teaching about perfect stance and head position. As I emphasized earlier, focus on the ball is crucial to take a decision on shot selection. To select one of the shot, it’s crucial that you look the ball journey from bowler hand (Repeating again) so you can judge the line and length of the ball. If length of the ball is full then play forward, if length of the ball is short then play backward and if the ball has extra swing or spin or misbehave in any other way then do not hesitate to leave the ball. Leaving the ball on last movement is not an easy task, your mind already decided to play the shot but at the last moment; it has to change decision to leave the ball. You can say; playing “leave the ball with intent” is hardest shot because you would get a fraction of milisecond to decide and execute. Leaving the ball could create the pressure on bowler because interpretation of leaving the ball is that you are understanding the ball very well even it is misbehaving. Your bat is your best friend on crease, select it wisely. I have reviewed some best cricket bat for the leather ball. Swing of the bat depends vary player to player. If a player plays with power then his bat swing will start from higher near or above from shoulder and end to above the next shoulder, so it utilizes maximum area of swing that generates a lot of power. Chris gyle, Sehwag, Manish Pandey, Adam Ghilchrist are such kind of players. Some players play with wrist so they do not use full area of bat swing, they swing their bat more with the wrist. VVS Laxman, Azharuddin are examples who use wrist a lot. If you are away from net practice then you are away from your form. No matter, how big player you are, you have to spend time in net to keep practicing the different drills. Physical fitness has a significant importance not only in cricket even all outdoor games. The fitter you are the better you will play. Your stamina, endurance level is crucial in cricket as you have to spend a lot of time on the field, especially when you are batting then you have to keep running between the wicket with full pace. A bowler has to extra care for his fitness, many of the fast bowlers get out from their career just because they had a lot of injuries and could not recover from these on time. The bowler has to take a good run up and through the bowl with pressure on their arm and shoulder so that requires a good muscle strength. Fielding require a similar or more level of fitness from batsman and bowler, you have to stand many hours on field and have to run, jump, sprint and throw the ball. A fitter fielder can field well and can save many runs. If you want to pursue your career as a professional cricketer, it’s crucial to make a fitness routine and diet plan to reach on a fitness level of a professional. Watch Virat’s interview on how being fit help him in the cricket here. Keep rotating the strike, converting single to double put a pressure on bowler but a run is never important in comparison to a wicket. Losing the wicket as runout is most disappointing thing in the cricket. So, you must aware of rules of running between the wicket. Respect the call of your partner: Even it is a run if your partner said NO that means NO. Calling authority: If the ball is behind of the wicket then call will be from non-striker and if the ball in front of the wicket then call will be from striker. Never give up: Once you started taking a run, do not give up; try your best to complete the run. There are many times when a fielder could not collect the ball or could not make direct hit. Misfield is a dangerous call: Do not run until you make sure it’s an easy run. If you have confusion then better to stay in the crease. Run fast as you can especially for first run and turn quickly for another. Save yourself by an inch: Keep your bat down to touch the crease line if you are on danger end. Look the fielder: Change the bat from right to left hand if you play the ball onside or change it from left to right if the ball in offside so you can see the fielder easily while turning for another run—Assuming you are a right-hand batsman. Note: Do not look the fielder while running, it slows down your pace. Turning at right point for another run is more important to run faster, so you must turn as soon as you touch the crease. Some batsman crosses the umpire(Bhai kyu? Rook jao!!) while running and almost kill the opportunity for next run. Your coach is your guru, he knows about your cricket skills more than anyone else. Take his advice seriously and do practice more n more. Feel free to comment if you have any question or any suggestion or anything to add here which can help others to learn. Did you find this useful? Want to give back a little? It only takes a second to share this post on Facebook or Twitter, and it helps other cricketers find CricketShala. If you want to get updates when I release more great content like this in the future, be sure to sign up for my email newsletter or email me on rakesh@cricketshala.com! In today’s era some of the best batsmen doesn’t read the ball from baowler’s hand, they intead read it from the pitch. It’s too late if you wait for the ball to pitch. You will have to start looking the ball as early as possible so you can make a judgment of line and length and can figure out where it will pitch. Thank you to share this. Nice insight on “keep eye on the ball”. I would link it in this article as a reference.